Raid the English coast, and partake in the rich spoils discovered there, as a Norse warrior from the Viking Age. The Carved Hilt Viking Short LARP Sword is a trustworthy companion for said adventure, lending its strength in battle. 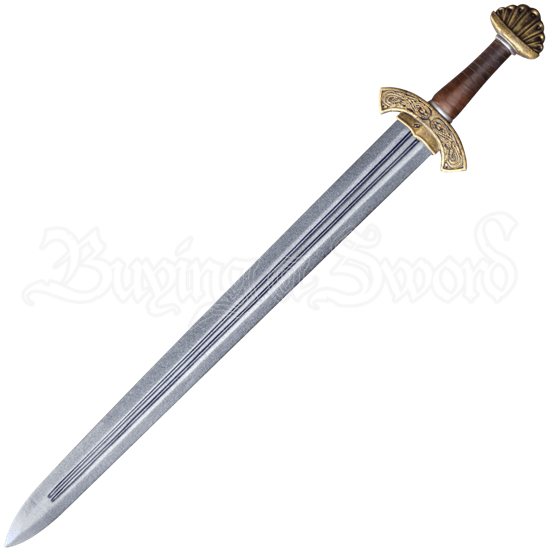 This short sword takes inspiration from those looted from the Frankish Empire. Crafted from a closed cell foam around a fiberglass core, the double-edged blade is sealed with a latex coating. A fuller runs down its length, lightening its weight and enhancing its strength. Cast from polyurethane, the golden handle features a hand-painted leather wrap and Norse knotwork on the curved cross-guard.